Sea Launch is a multinational spacecraft launch service that used a mobile maritime launch platform for equatorial launches of commercial payloads on specialized Zenit-3SL rockets through 2014. By 2014, it had assembled and launched thirty-two rockets, with an additional three failures and one partial failure. All commercial payloads have been communications satellites intended for geostationary transfer orbit with such customers as EchoStar, DirecTV, XM Satellite Radio, PanAmSat, and Thuraya. The launcher and its payload are assembled on a purpose-built ship Sea Launch Commander in Long Beach, California, US. The assembled spacecraft is then positioned on top of the self-propelled platform Ocean Odyssey and moved to the equatorial Pacific Ocean for launch, with the Sea Launch Commander serving as command center. The sea-based launch system means the rockets can be fired from the optimal position on Earth's surface, considerably increasing payload capacity and reducing launch costs compared to land-based systems. Sea Launch was established in 1995 as a consortium of four companies from Norway, Russia, Ukraine and the United States, managed by Boeing with participation from the other shareholders. The first rocket was launched in March 1999. On March 17, 2006, it was announced that Jim Maser, the President and General Manager of Sea Launch, would leave the company to join SpaceX as President and Chief Operating Officer. Sea Launch emerged from bankruptcy effective October 27, 2010. Energia Overseas Limited, a Russian corporation, is majority owner of the reorganized entity, with Boeing and other American companies retaining minority shares. In 2013, Boeing sued RSC Energia, PO Yuzhnoye and KB Yuzhnoye. According to Boeing the companies refused to pay more than $350 million following the joint venture's bankruptcy filing in 2009. In mid-2014, following the 2014 Russian military intervention in Ukraine and the subsequent unrest in the eastern part of the country, there were a number of Russian media reports that indicated Sea Launch may be planning to inactivate the Odyssey launch platform. The company formally denied those reports in June 2014, indicating it is continuing to buy Zenit rockets from Ukraine, and is still promoting its launch services to the international market, even in August 2014. However, in August 2014, Sea Launch conducted a reduction of their staff and removed from operating status both the Commander and Odyssey vessels in order to reduce operating costs during a period where they have no launches scheduled until late 2015. In July 2015, industry experts stated that the Chinese government was considering the purchase of the Sea Launch command ship and launch platform assets, but this was not confirmed by either company or Chinese government officials. In September 2015, Boeing won a court judgement against the Russian and Ukrainian partners within Sea Launch. The decision set up a court trial planned for November 2015 where Boeing would argue that it was not properly reimbursed for US$356 million of expenses incurred while operating the Sea Launch launch system. This litigation was decided in favor of Boeing on May 12, 2016. As of December 2015, Roscosmos and Energia were attempting to find a buyer for the Sea Launch assets, due to the high cost of infrastructure maintenance of approximately US$30 million per year. In September 2016, S7 Group, owner of S7 Airlines announced they were purchasing Sea Launch. Sea Launch was founded by four companies from four countries, which shared the original ownership of Cayman Islands-registered Sea Launch. After reorganising from Chapter 11 bankruptcy in 2010, a majority share of the company was acquired by Russian interests. The project was helped by Hughes Space and Communications, which in 1995 signed the first contract for 10 launches and 10 options, valued at $1 billion, and Space Systems/Loral, which then signed a five-launch contract. Total cost of the project has been reported at $583 million in 1996. Chase Manhattan arranged about $400 million in loans in 1996. Loans were later guaranteed against political instability in Russia and Ukraine through 2012 by the World Bank (up to $175 million, of these up to $100 million in Russia and up to $75 million in Ukraine) and the European Bank for Reconstruction and Development (up to $65 million). Sea Launch has a reciprocal agreement with Arianespace and Mitsubishi Heavy Industries through the Launch Services Alliance, providing assurance in case either company's system is not able to launch a payload for reasons of reliability, capacity, backlog, or otherwise. This was used for the first time in 2004 when Arianespace's Ariane 5 had to reschedule a group of launches for reliability reasons. In 1999, shortly after the company was founded, the Sea Launch consortium claimed that their launch-related operating costs would be lower than a land-based equivalent due in part to reduced staff requirements. The platform and command ship have 310 crew members. The first demonstration satellite was launched on March 27, 1999, and the first commercial satellite on October 9, 1999. Sea Launch has launched 36 rockets with 32 successes and 1 partial success as of March 2019. The first failure, of a Hughes-built communications satellite owned by ICO Global Communications, occurred on the second commercial launch on March 12, 2000, and was blamed on a software error that failed to close a valve in the second stage of the rocket. A second rocket failed to launch on January 30, 2007, when Zenit-3SL exploded on the launch pad with the Boeing 702 NSS-8 satellite on board, seconds after engine ignition. All Sea Launch missions to date have used the custom-designed three-stage Zenit-3SL launch vehicle, capable of placing up to 6,000 kg (13,000 lb) of payload into geosynchronous transfer orbit. Sea Launch rocket components are manufactured by SDO Yuzhnoye / PO Yuzhmash in Dnipro, Ukraine (Zenit rocket for the first and second stages); by Energia in Moscow, Russia (Block DM-SL for third stage); and by Boeing in Seattle, United States (payload fairing and interstage structure). Sea Launch rockets are assembled in Long Beach, California. The typical assembly is done on board the Assembly and Command Ship (the payload is first tested, fueled and encapsulated in the nearby Payload Processing Facility). The rocket is then transferred to a horizontal hangar on the self-propelled launch platform. Following rocket tests, both ships then sail about 4,800 km (3,000 mi) to the equator at 154° West Longitude, 0°N 154°W﻿ / ﻿0°N 154°W﻿ / 0; -154, in international waters about 370 km (230 mi) from Kiritimati, Kiribati. The platform travels the distance in about 11 days, the command ship in about eight days. With the platform ballasted to its launch depth of 22 m (72 ft), the hangar is opened, the rocket is mechanically moved to a vertical position, and the launch platform crew evacuates to the command ship which moves about five kilometres (3.1 mi) away. Then, with the launch platform unmanned, the rocket is fueled and launched. The final ten seconds before launch are called out simultaneously in English and Russian. The Sea Launch NSS-8 launch explosion on January 30, 2007. The explosion has obscured the floating launch pad platform. On January 30, 2007, the Sea Launch Zenit-3SL rocket carrying NSS-8 and 500 tons of fuel exploded on launch. Available imagery shows a fireball much larger than the launch platform at sea level. Since the launch pad platform is vacated by all engineers during the automated launch process, there were no injuries. On February 1, 2007 Sea Launch released a statement detailing its status. It is believed that the failure was caused by a foreign object being ingested by the engine turbopump, causing the rocket to crash immediately. On February 3, 2007, photographs of the damage were posted on internet forums. The launch platform damage is mostly superficial, though blast deflectors underneath the launch platform were knocked loose and were lost when they fell into the sea. 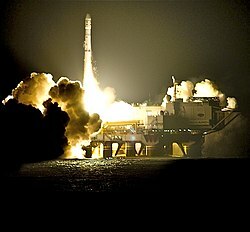 In March 2007, shortly after the NSS-8 launch failure, Hughes Network Systems switched the launch of SPACEWAY-3 from a Sea Launch Zenit-3SL to an Ariane 5. Repairs of the launch platform were completed in September 2007. The Sea Launch platform underwent repairs in Canada, docked near CFB Esquimalt, just west of Victoria, British Columbia, and departed on July 31, 2007. Both vessels returned to their home port in Long Beach, California. During project development in 1998 Boeing was fined US$10 million by the United States Department of State for technical violations of the Arms Export Control Act in handling of missile technology while dealing with its foreign Sea Launch partners. This is the largest civil penalty of its kind, although it could have been as much as US$102 million. The Sea Launch project was suspended for two months during the investigation. The Department of State found that between January 1994 and January 1998 Boeing illegally exported "defense articles" and "defense services", although no national security breaches were determined. The violations were uncovered by Boeing's internal investigation. At about the same time United States Customs Service attempted to block Sea Launch from bringing Zenit-3SL rockets (classified as missiles) into California for assembly without a munitions import licence. The matter was settled in the company's favour. Also in 1998, 16 member states of the South Pacific Forum issued a communiqué asking the United States to suspend the project indefinitely until and unless their environmental concerns are remedied. It was mostly criticized by the island nation of Kiribati. The project was criticized in 1997 by International Transport Workers' Federation (ITWF) for registering its sea vessels in Liberia. In May 1999 Sea Launch reached an agreement with the ITWF, which allows crew members to use ITWF inspectors. Using existing Zenit infrastructure at the Baikonur Cosmodrome, the "Land Launch" system is based on a modified version of the Sea Launch vehicle, the three-stage Zenit-3SL rocket. Land Launch's Zenit-3SLB vehicle addresses the launch needs of commercial satellites weighing up to 3.5 metric tons (3.9 short tons). The two-stage Zenit-2SLB is also available for lifting payloads up to 13 metric tons (14 short tons) to inclined low Earth orbits. The first launch was on April 28, 2008, when a Zenit-3SLB launched Spacecom Ltd's AMOS-3 spacecraft from LC-45/1 at Baikonur. The rotational speed of the Earth is greatest at the equator, providing an extra launch "boost". The need for a "plane change" to the zero degree inclination of geostationary orbit is eliminated, providing a major extra launch "boost". This allows 17.5%-25% more mass to be launched to geostationary orbit than the same rocket launched from Cape Canaveral, which is at 28.5 degrees north latitude. Any orbital inclination could be reached, thus (for example) combining in one launch site the attainable inclinations of both Cape Canaveral and Vandenberg. An ocean launch reduces risks related to launching over populated areas, providing better safety to third parties. Absence of range conflicts with other launch systems and a near total absence of ship or overhead air traffic that would constrain launch. Sea Launch was awarded the Space Foundation's Space Achievement Award in 2000. ^ "Sea Launch rocket company returns to service". BBC News. September 25, 2011. ^ a b Fedorinova, Yuliya; Lemeshko, Andrey (September 27, 2016). "Russian Airline Owner to Challenge Musk, Bezos in Space". Bloomberg News. Retrieved September 28, 2016. ^ "Sea Launch Complex description". S7 Space. Retrieved November 13, 2018. ^ Cain, Fraser (October 21, 2003). "Sea Launch... On Land?". Universe Today. Retrieved June 28, 2016. ^ a b "Zenit 3SL". Orbireport.com. 1997–2000. Archived from the original on January 18, 2006. ^ "Sea Launch primed to make history". BBC News. March 24, 1999. Retrieved June 28, 2016. ^ "Jim Maser to Join SpaceX as President and Chief Operating Officer". PRNewswire. March 17, 2006. ^ James, Andrea (June 24, 2009). "Boeing's satellite launch subsidiary files for Chapter 11". Seattle Post-Intelligencer. ^ Kamalakaran, Ajay; Azhar, Saeed (June 22, 2009). "Sea Launch files for Chapter 11 protection". Reuters. ^ Korn, Paula (June 22, 2009). "Sea Launch Files Chapter 11 to Address Financial Challenges" (Press release). Boeing. Archived from the original on June 26, 2009. ^ O'Keeffe, Niall (August 6, 2010). "Russian money to drive Sea Launch relaunch". Flight International via Flightglobal.com. Retrieved August 9, 2010. ^ "Sea Launch Company Emerges From Chapter 11". Sea Launch. October 27, 2010. ^ a b c Raymond, Nate (February 4, 2013). "Boeing sues Sea Launch partners for $350 million". Reuters. Retrieved May 27, 2014. ^ Bodner, Matthew (June 24, 2014). "Sea Launch Denies Plans to Shelve Launch Platform". Moscow Times. Retrieved July 24, 2014. ^ a b Sea Launch Takes Proactive Steps to Address Manifest Gap, August 22, 2014, News & Events – Press Releases – 2014, accessed August 27, 2014. ^ de Selding, Peter B. (July 17, 2015). "China Eyes Purchase of Sea Launch Assets". Space News. Retrieved August 15, 2015. ^ Boeing Wins U.S. Court Judgment Against Russian, Ukrainian Sea Launch Partners, SpaceNews, September 30, 2015, retrieved November 27, 2015. ^ Zak, Anatoly. "Sea Launch venture". RussianSpaceWeb. Retrieved May 21, 2016. ^ Sea Launch On The Sales Block?, Satnews, December 3, 2015, accessed December 8, 2015. ^ a b "The Sea Launch Partnership". Energia. Archived from the original on February 14, 2001. ^ Picone, Chris; Stier, Peter G. (October 27, 2010). "Sea Launch Company Emerges From Chapter 11" (Press release). Sea Launch. Archived from the original on September 27, 2011. Retrieved September 25, 2011. ^ Wilson, Jim (August 1999). "Sea Launch". Popular Mechanics. 176 (8): 64–67. ^ "The Rocket - Zenit-3SL". Archived from the original on April 4, 2009. Retrieved June 3, 2012. ^ "Sea Launch Successfully Delivers EchoStar XI to Orbit" (Press release). Sea Launch. July 16, 2008. ^ "Sea Launch Successfully Delivers Galaxy 19 to Orbit" (Press release). Sea Launch. September 24, 2008. ^ "Sea Launch Successfully Delivers SICRAL 1B Satellite to Orbit" (Press release). Sea Launch. April 20, 2009. ^ "Sea Launch Delivers the Intelsat 19 Spacecraft into Orbit" (Press release). space travel. June 4, 2012. ^ "Sea Launch Experiences a Launch Failure on Intelsat 27 Mission" (Press release). Sea Launch. February 1, 2013. ^ "Sea Launch Successfully Launches EUTELSAT 3B" (Press release). Sea Launch. May 27, 2014. ^ "Satellite-Strapped Rocket Explodes on Platform (Video)". Popular Mechanics. ^ "Sea Launch Experiences Anomaly during NSS-8 Launch" (Press release). Sea Launch. January 30, 2007. Retrieved January 30, 2007. ^ Ray, Justin (January 30, 2007). "Sea Launch Rocket Explodes on Pad". Spaceflightnow.com. ^ "Sea Launch Assesses Status and Plans for Next Steps" (Press release). Sea Launch. February 1, 2007. ^ "The Zenit rocket explodes on the launch pad in the Pacific Ocean". russianspaceweb.com. January 30, 2007. ^ Bergin, Chris (February 4, 2007). "Sea Launch makes for home as investigation continues". nasaspaceflight.com. ^ "Hughes Signs Contract with Arianespace to Launch SPACEWAY 3" (Press release). Hughes. March 1, 2007. ^ "Sea Launch awarded SPACEWAY 3 contract by Hughes Network Systems" (Press release). Sea Launch. December 8, 2005. Archived from the original on June 29, 2011. ^ "Sea Launch Receives Zenit-3SL Hardware for Next Launches" (Press release). Sea Launch. September 3, 2007. ^ "New Gas Deflector Arrives at Sea Launch Home Port" (Press release). Sea Launch. August 23, 2007. ^ a b c Woodard, Colin (September 22, 1999). "High-seas launch worries islanders". The Christian Science Monitor via the Federation of American Scientists. ^ Grimaldi, James V (October 1, 1998). "Boeing Dodges Stiffer Fine, Resumes Sea Launch Project -- No National Security Breach In Satellite-Launching Program; Criminal Charges Aren't Likely". The Seattle Times. ^ Kempton, Daniel; Balc, Susan (August 10, 2001). High Seas Satellite Launches: Paragon of Post Cold War Cooperation or Unregulated Danger?. Convention of International Studies. Hong Kong: International Studies Association. ^ "Space Achievement Award". National Space Symposium.